"Ænon" is the Greek rendition of the Semitic term for "spring" or "natural fountain", like the Hebrew and Arabic ‍ '​ayn. In the water-poor Middle East, places owning a spring tend to be named after that water source, so that toponyms consisting of or containing the Construct state word "ein-" are common. 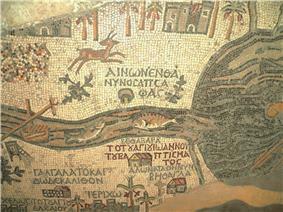 The particular site mentioned in the Gospel of John is therefore closer identified as "Aenon near Salim". John 3:23 is the only place in the Bible where the name Aenon is found. Another possible location, which is supported by Eusebius' description in his Onomasticon, is at a spot "8 Roman miles South of Scythopolis (Beisan)". This view was already supported by the 19th-century Smith's Bible Dictionary and the 1915 International Standard Bible Encyclopedia and is still favoured by some.